Tripura governor Tathagata Roy tweeted that Pathankot terrorists should be wrapped in pigskin and buried in pig excreta. Why does Roy hold such beliefs? Should action be taken against him? The Governor of Tripura, Tathagata Roy, has a remarkable ability to showcase his communal credentials. The latest evidence of his weird thought process is in his ruminations on the Pathankot terror attack. With reference to the terror strike, Roy tweeted on 2 January his prescription to "dissuade suicide attacks". "Ensure they can't go to their heaven," his tweet said, adding, "US General Pershing showed how". In subsequent tweets, he went on to tell the story of American General John Pershing, who, according to Roy "put 50 Islamist Moro rebels in Philippines before a firing squad and shot 49 of them with bullets dipped in pig blood...He then let go of the 50th rebel to tell his comrades that having come in contact with pigs the other 49 will burn in hell". "Reportedly, it worked" Roy tweeted, adding that the "Russians, following Gen Pershing's logic, are reportedly burying Chechen rebels in pigskin with face down". Just as the siege went on over the next couple of days and turned ghastlier, Roy's relentless tweets too got nastier. 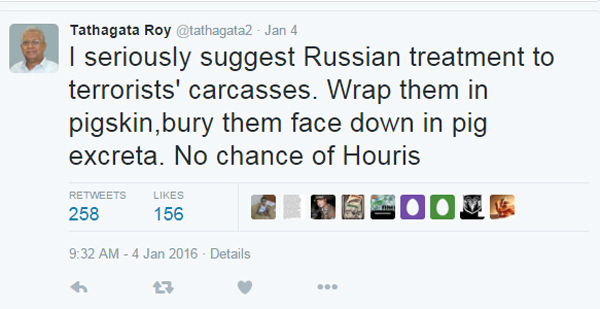 He tweeted on 4 January, "I seriously suggest Russian treatment to terrorists' carcasses. Wrap them in pigskin,bury them face down in pig excreta. No chance of Houris". In Islamic terminology, Houris are popularly considered to be fair maidens in heaven whose company shall be enjoyed by all believers who go to heaven. The allusion to pigs through the expressions "pig blood", "pigskin" and "pig excreta" has been made because orthodox Islam considers pigs to be impure, unholy creatures. These tweets convey what crassness is Roy capable of, apart from betraying his Islamophobia. As his last tweet started getting noticed and drawing flak, the Governor kept going on, tweeting on 6 January, "Abuses pour in against my tweet about Russian treatment to suicide jihadis. Message is clear: PLEASE don't do this, it'll be end of suicide attacks". In another tweet, he expressed his inability to understand "this flood of sympathy for carcasses of jihadi terrorists". Roy is already well-known for many of his tweets like the one in which he expressed his happiness with what Hindus did in Gujarat in 2002 and another in which he raised the bogey of "Islamic takeover of West Bengal". In another tweet, he had said, "I admire #UjjwalNikam who says he fabricated Biryani story to counter our 'secular' media's campaign to paint Kasab as a 'poor little boy'". Another tweet of his had kicked up a major storm on 31 July, 2015. Following the hanging of Yakub Memon for his role in the 1993 Mumbai bomb blasts, Roy tweeted, "Intelligence should keep a tab on all those (except relatives & close friends) who assembled before Yakub Memon's corpse. Many are potential terrorists". 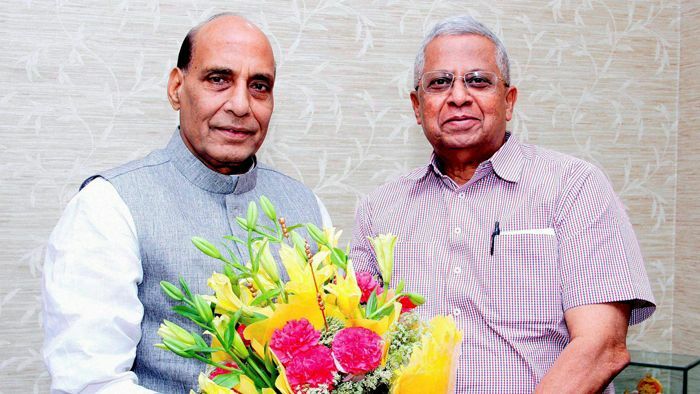 His appointment as Tripura Governor had come out of the blue in May 2015. In a post on his blog, 'Against the current', dated 2 January, 2016, Roy himself says that he was informed of his appointment over telephone "bang in the middle of my Kung Pao chicken" at Delhi's Hotel Imperial. After being sworn in as Governor, he had expressed regret that he will now be unable to tweet in keeping with his politics. However, he seems to have somehow realised that holding a high constitutional office in the country is no barrier at all from making crass and communal statements. Given that he himself says that as Governor of Tripura, he has "little to do" apart from "ribbon-cutting", as expressed in his blog, President Pranab Mukherjee might actually be doing him a favour if he relieves him from his duties. His tweets will still be around, but at least they won't have any association with the Raj Bhavan. Robots judging beauty pageants? Hello 2016! Terror attacks have claimed 2212 lives in 27 years on Indian soil. What have we learnt?